On January 3, 2005 Angels Baseball, L.P. announced that it would change the name of the club from Anaheim Angels to Los Angeles Angels of Anaheim. The new name sparked outrage among Anaheim and Los Angeles city leaders, who argued that a team that does not play its home games within the city or county of Los Angeles should not claim to be from Los Angeles, even though the Los Angeles Rams played many years in Anaheim without incident. They also regarded the name a lingual farce, as the English “The Angels” was mixed with the Spanish “Los Angeles,” especially in a region where Spanish is so heavily used. With the support of the city of Los Angeles, The Walt Disney Company, and every city in Orange County, the city of Anaheim sued the Angels, claiming the team violated its lease with the city. The team countered that they were in full compliance with the lease, since the lease only stipulated that the team name contain “Anaheim”, and the new name was well within the bounds of this stipulation. 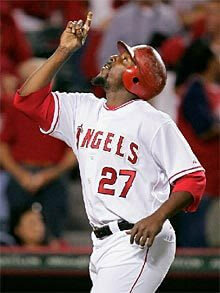 A jury trial, which concluded February 9, 2006 resulted in a verdict siding with the Angels and allowing the team to keep the new name.